executes real property acquisitions by purchase or lease. disposes of property through sale, lease or other authorized method. manages space in buildings and adjacent areas. provides building management services for facilities owned or operated by the District. The portfolio division of DGS provides multiple services to both District agencies and its constituents. Portfolio both manages and secured over three million square feet of contracted Lease space for 43 agencies throughout all eight wards of the District. Portfolio is not just limited to providing services to District agencies as they also provide services to our constituents through programs like Eastern Market and the out lease program. Eastern Market is entirely managed by the portfolio division who secures vendors and provides activates on weekends and nights. 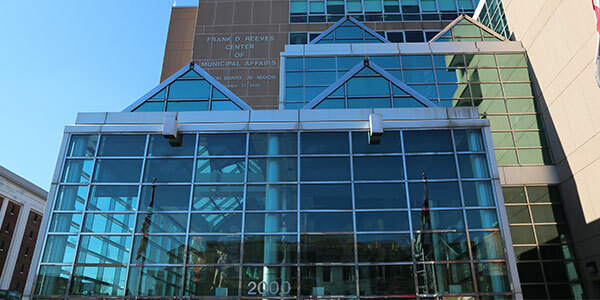 The out lease program is a program that portfolio monitors on behalf of the District, such as the food courts at One Judiciary Square (OJS) and leasing out space that is district owned. By working together, DGS helps agencies move to new and more efficient workplaces. DGS's Protective Services Division, in combination with the Metropolitan Police Department and security contractors, works diligently to protect our city’s investments, residents and visitors. Eastern Market is Washington, DC’s oldest, continually operating, public fresh food market. As a District interagency team, ESA establishes the foundation for support, training, and tools needed by DC school administrators to develop customized school-level Emergency Response Plans. The District's Employee ID Badges program has been transferred to the Department of Human Resources (DCHR). The Facilities Division of DGS oversees the employee parking program at various District facilities. This includes issuing permits, parking lot maintenance and quality assurance. The Department of Parks and Recreation (DPR) Permit Office manages and issues permits for all DPR recreation centers, facilities, fields, parks and community gardens. Search properties owned and managed by DGS by address, area or map. Information provided includes absentee owner addresses. PSD is responsible for managing and providing security and law enforcement at District owned and leased properties. DGS and DME provide an inventory of surplus school buildings. Policies and procedures for use of DC School facilities and grounds.